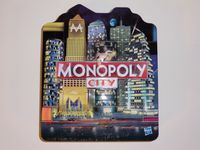 In addition to the shaped tin "box," this version / edition includes 2 extra special (exclusive) buildings : the Zoo and the Casino ! I have included some pictures of this edition ; just click on the "Browse # Images" link located above and to the left, to view them. Note that this version is also known in the general market (public) as the "Shaped Tin Edition."